Oreo Peppermint Bark is an easy treat made with Oreo cookies, peppermint candies, and white chocolate. The combination of cream-filled chocolate cookies, mint, and sweet white chocolate is delicious! Prepare a 10x15 baking sheet by lining it with aluminum foil and spraying the foil with nonstick cooking spray. Preheat the oven to 350 degrees. Coarsely chop the cookies with a large knife, reserving 4 cookies for later use. Spread the chopped cookies on the baking sheet in an even layer, trying to cover any large holes. It’s natural to have a few small gaps but try to get a fairly even layer of cookie chunks. Put the unwrapped peppermint candies in a food processor and process them until they are a fine dust. Sprinkle the crushed candies over the chopped cookies in an even layer, covering the entire tray. It’s important to get the candy spread evenly otherwise some spots will have a very thick layer of hard candy that’s difficult to chew. Place the tray in the preheated oven for 5-7 minutes. While the candy is in the oven, finely chop the remaining 4 cookies, or pulse them in a food processor, until they are fine crumbs. After 5-7 minutes in the oven, the peppermint candy should be liquefied. Sprinkle the white chocolate chips on top of the candy in an even layer, and return the pan to the oven for 2 minutes to soften the chocolate. Use a knife or an offset spatula to spread the chocolate in an even layer over the cookies. While the chocolate is still wet, sprinkle the top with the cookie crumbs and press down gently to adhere them to the white chocolate. Once the candy reaches room temperature, place it in the refrigerator for 20 minutes to set the white chocolate. After it is completely set and cool, break the bark into small pieces with your hands and serve. 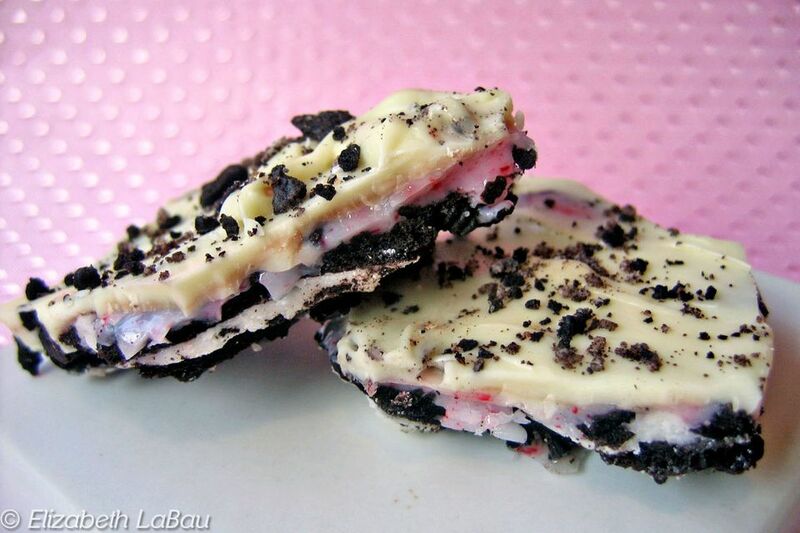 Store Oreo Peppermint Bark in an airtight container in the refrigerator for up to 2 weeks. Bring to room temperature to serve. Cookies and Cream Bark - Just Two Ingredients! Pucker Up Bark - Sweet and Sassy Chocolate For Valentine's Day! Oreo Rocky Road Bark is a Twist on a Familiar Favorite. S'mores Toffee Bark is a Fun Twist On Traditional S'mores! Everyone Will Love This Sweet and Tangy Chocolate Lemon Bark! Marzipan-Covered Cherries -Add Marzipan to Chocolate-Covered Cherries!